Think Of A Modern Mercedes And The CLK Is The Model You Tend To Picture. In Both Coupe And Convertible Forms, It Embodies The New Image The Marque Would Like To Cultivate - And Is Highly Sought After On The Used Market. Launched in June 1997 to replace the E-class coupe and convertible models, the CLK was in fact based on a C-class platform, though it had the E-class double headlamp look. Appropriate then, that it also shared a mixture of engines from the two mainstream saloon ranges. Mainstream models had 2.0-litre normally aspirated and 2.3-litre 'Kompressor' supercharged four cylinder engines. 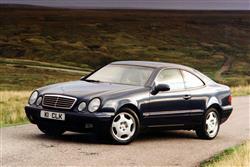 At the top of the range, there was a CLK320 model, powered by the E-class's 3.2-litre V6. Trim levels offered a choice of either Elegance or Sport variants, the latter became Avantgarde about a year after introduction. Convertible CLKs were launched in June 1998, with a range broadly similar to that of the Coupe (though a 2.0-litre version wasn't offered). The CLK range was upgraded in August 1999, with minor visual changes and the addition of two more models - a 4.3-litre V8 and an AMG 55 5.5-litre flagship. The second generation model was launched in Coupe form in Autumn 2002 (almost a year before the Cabriolet version) and featured a new, much stiffer platform based on the latest post-2000 C-class. This enabled a pillar-less side window profile and provided for much improved handling. There was a wider engine choice starting with a 1.8-litre supercharged 'four' for the CLK 200K with 163bhp, a 2.6-litre V6 for the CLK 240, the same 3.2-litre V6 for the CLK 320, a new 5.0-litre V8 for the CLK 500 and an uprated 5.4-litre V8 for the flagship CLK 55AMG. There was even a 2.7-litre diesel version. In the metal, the Coupe's profile is hunched and aggressive - to an extent that photos fail to adequately communicate. Where the SLK roadster is pretty, the CLK is belligerent. Finding one filling your rear view mirror, you automatically move over. And you automatically recognise it for what it is; a car in its own right. Arguably, you have to go back to a car like the 300SLR to find an affordable Mercedes coupe or cabriolet model of which that was really true. The E-Class coupes and cabriolets that the CLK replaces were after all, like their predecessors, merely two-door versions of the old E-Class saloon. Not so here. Though the CLK shares the 'four eyes' headlamp arrangement of the E-Class range, in most other respects, it's actually quite different. In fact, Mercedes has used a variety of ingredients to make this car what it is. A floorpan from the C-class; the better suspension, brakes and gearbox developed as part of the SLK programme; and a variety of engines used across both C and E-class ranges. All of which makes it quite appropriate that the CLK lies neatly between these two model line-ups, in terms of both size and price. In dimensional terms, you'll find it 25cms shorter than an E-class saloon and 8cms longer than a C-class. Clever features include Brake Assist, a system that automatically boosts the pedal pressure in an emergency stop, and 'ASR', a traction control system linked both to the throttle and the brakes. When folded, the Cabriolet's three-layered hood stows completely away beneath a body-coloured compartment cover which features twin airdomes supposed to evoke 'classic race car styling'. The roof is simple to operate; a central rotary handle on the windscreen frame is all that's needed to release or lock the soft top and the rest of the work is performed by an electro-hydraulic servodrive activated by a pull/push switch next to the gear lever. Very little goes wrong. Don't pay unrealistic prices, look out for cars that have been unreasonably thrashed, check for signs of accident and, on convertibles, hood damage and insist on a proper authorised dealer service history. With Mercedes offering a generous four-year support package and virtually lifetime cover on models from late 1999 on, a proper service record is important. (approx. based on a 1998 CLK230 incl. VAT): front brake pads are around £53, a front exhaust (including catalyst) is about £641 with the rear section about £291. A headlamp is about £184. An air filter is about £12, front shock absorbers around £85, an oil filter around £7 and a windscreen is around £170. These are sports cars that you can get excited about driving. 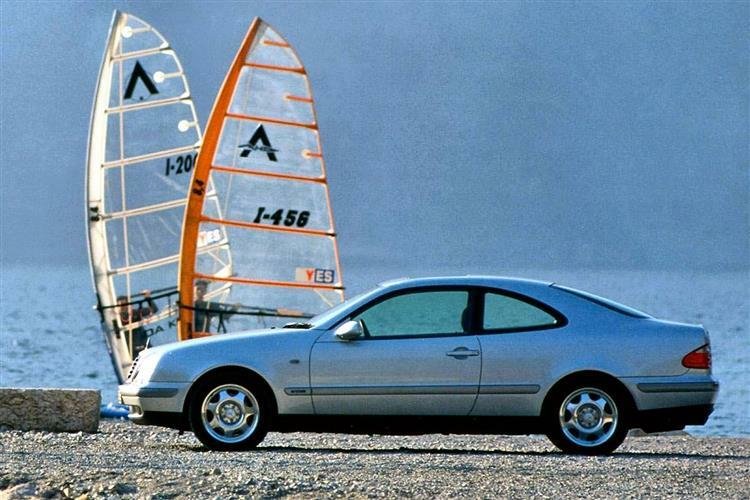 Rest to sixty in the mid-range CLK 230 Kompressor coupe model takes just 8.2s on the way to 143mph. More importantly in speed-restricted Britain, the cars are involving in a way that you might not expect. They ride serenely, don't roll much and can be placed through a corner with perfect precision.